When it comes to organization, there always seems to be something we need to do. Whether it is tidying up your paperwork, organizing your jewelry or any of those little things that simply just need a place, we are here with some great do-it-yourself tips that will help you to live a neat and tidy, organized life – or at least try to! This easy to make accessory organizer not only serves a fab purpose, but it also looks super cool hanging on a wall in your home. 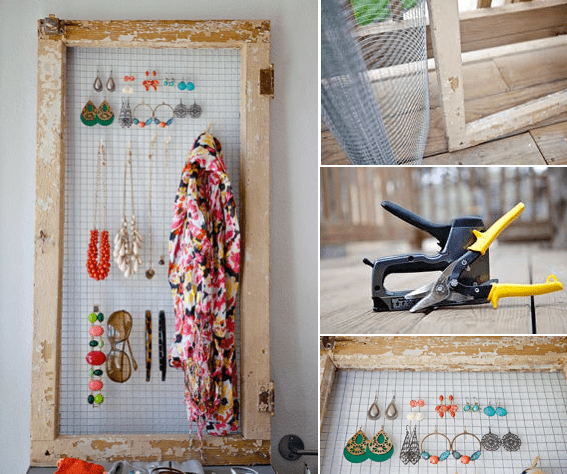 All you need is window/picture frame (the size entirely depends on how big you need it to be), chicken wire, staple gun, and wire cutters. All done! You now have a chic, simple, extremely helpful organizer for all your favorite accessories. This is a nifty trick if your family get through cereal rather quick and whoever thought that the boxes could be turned into amazing drawer dividers. This is a DIY job that combines crafts and is a great job that you can get the kids involved with. What you need: Cereal boxes, colored paper, scissors, ruler and glue.